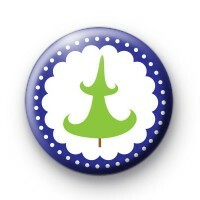 Blue and Green Christmas Tree Badge with a blue background with white polka dots and a traditional Christmas tree in the centre. Our Christmas tree badges are great for getting into the Christmas spirit and make for a merry Christmas. We have hundreds of Xmas badges to choose from in our Christmas badge category, including a lot of Christmas tree badges. Be sure to order these early in December as they are all handmade in our workshop & we get super busy processing all of your orders. Standard 25mm Christmas badge. We have hundreds of Christmas badges to choose from. From Santa Claus and Father Christmas badges to Rudolph the red nosed reindeer badges, Christmas elf badges and Christmas jumper badges. We have something for everyone & they make great stocking stuffers.